I decided to go with 40 ct. Meadow Rue instead of Pearled Barley. It just wasn't dark enough for the January pattern to show up. The Meadow Rue is also very close in color to the recommended linen - R&R Olde Town Blend (I found a piece in my stash and matched it up). I also got a couple more market items from Down Sunshine Lane today. 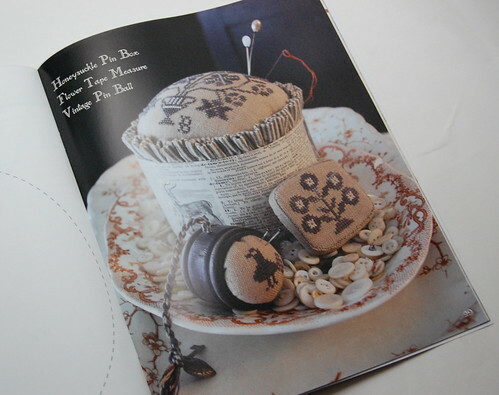 With Thy Needle and Thread "Mary's Best Handework" and Blackbird Designs "Honeysuckle Manor"
Here is just one of the many things I love from the Honeysuckle Manor book. Edited to add: Total stitch count of all the houses on one piece of fabric... 387 x 261. 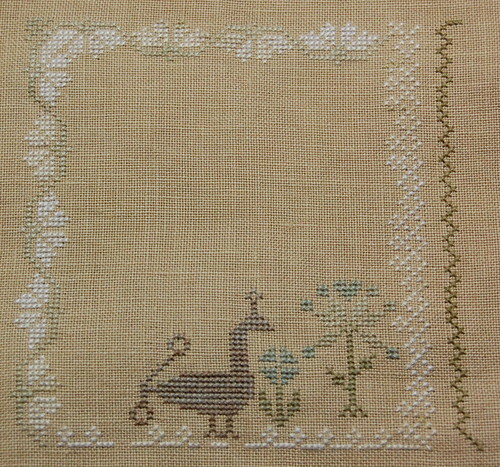 Each design is 75 x 85 with 3 stitches in between each design. Two bonus charts are going to be released in October. Did you read about personalizing the series...I think I'm going to do that in each block some date or name that means something to me...are you going to do that too? You girls are making me want to take the plunge....Manor House it at the top of my list of purchases....Now I just have decide on Lakeside or R&R...hmmmm.. I so can't wait to get to my LNS! I love to personalize my things! Nicole, too funny! I got the Mary's Best Handework today also! Even with the ripping out, you still got a lot done! I just love everything that BBD came out with at this Market. Those pincushions especially - love, love them. Great start on the series - I was wondering about the fabric being too light, but I'll take your suggestion on the Meadow Rue. I think this is going to be a great piece stitched up all together. Sorry about all the frogs. Hopefully they won't visit again. I saw them stitched up at market and they were beautiful! Great start Nicole! I like your choice of fabric too! I love your new start and your choice of fabric. This and the Honeysuckle Manor book have been ordered and I can't wait for them to arrive. It's beautiful, Nicole! Nice to know that the Meadow Rue is a close match to the Olde Towne Blend. 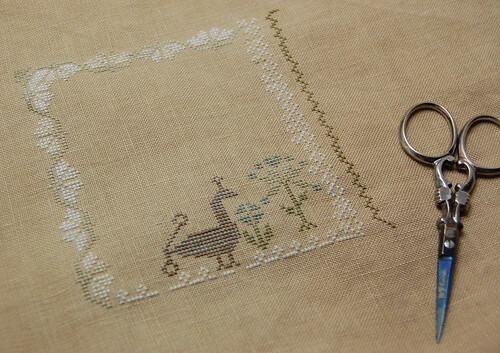 I may have to get that With Thy Needle and Thread chart. I've been trying to resist but it's so pretty! I love how bad you've been Nicole, that it's soooo good! Great fabric choice and thanks for letting us know the different names. Does Amy carry LL usually? I see she has Light Examplar listed on her site. Does she stock other colours? These two are going to look so good together. No wonder you couldn't wait to start. Such a shame about having to pull some of it - that's always annoying. Love your new stash. I've got WTN&T's chart on order and will definitely get the BBD booklet in the future. Thanks for showing your wonderful stitching/stash! Thank you for the picture of the projects inside Honeysuckle; I've been dying to see them. Your Progress on your WIP is coming along just beautiful. Oh, I love your new start. The Meadow Rue is such a nice color. 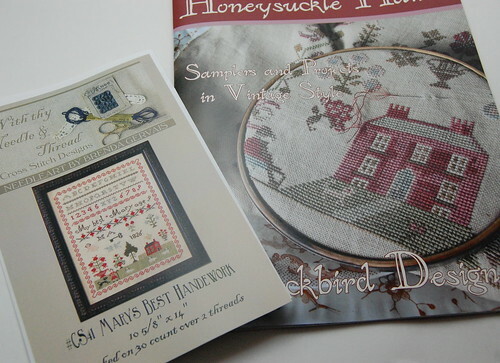 We certainly have the same tastes...I purchased Mary's Best when it first became available from Country Stitches and last weekend I purchased the Honeysuckle Manor book (along with SB's new kit "My Land" and a few other must-have's) LOL! Great purchases - I love the "Mary's Best Handework"! Lovely start Nicole, I hope the frogs stay away from now on. Great start - this series is going to be beautiful! I really like your start of the Anniversares of the Heart. It is going to look great on the Meadow Rue. After seeing this progress I would like to do this all on one piece of fabric as well. I haven't picked up the patterns yet put hope to do so this weekend. What size fabric will I need to do it all on one piece on 40 or 36 ct? Or if you could provide the stitch count that might also help. Hi Robert - stitch count is 387 x 261. A fat quarter (with a two inch border) will work if you're using 40 ct. Hope this helps!! I love your start, Nicole!! It looks great. I like it on the Meadow Rue. Love the new stash, too! I think I'm going to have to start this asap!! So pretty!! Now I need fabric. Drat. I love that little pincushion with the ruffled edge - so pretty in person! Oooh, so pretty. I'm liking those things, too, but will I really stitch them? There are so many things already in my stash! I really want Honeysuckle Manor most. Decisions, decisions. I can't wait to start the houses but first I must order the fabric! I love Honeysuckle Manor too and have already chosen a few smalls to start. It's gorgeous. After seeing your start I've decided I cannot wait to start mine :-). A very pretty start Nicole. I think this series is going to be a lovely one. Thanks for the pics of the Honeysuckle Manor book. I was hoping someone would give us a glimpse of the other projects in the book. Did you see on the BBD -OOne Stitch at a Time blog that there is an correction to the book? Just discovered your blog. It's lovely! I've started the Anniversary series. I'm doing them individually. I've started the first one...it's so pretty. I'm bad, too! You are not alone!